Born: 24 July 1945 Edinburgh. Died: 3 February 2016 in Gullane, East Lothian, aged 70. John Ellis who has died aged 70 was a top-class rugby player who toured Argentina as a member of the Scotland squad in 1969 and gave sterling service over many years firstly to Jordanhill College and then Heriot’s FPs,the club with which he is most closely associated. He also represented Edinburgh district several times. Principally a scrum half, he was a versatile player who could cover most positions behind the scrum and it was as a utility back that he went on the Argentinian tour. Although no caps were awarded as the opposition were not then considered of appropriate standard, Scotland took a strong squad captained by Jim Telfer and including the likes of Alistair McHarg,Duncan Paterson,Chris Rea,Roger Arneil,Sandy Carmichael and Ian McLauchlan among other notables. John played twice in the six match tour, the first at scrum half in a win over a District Select team in Buenos Aires where his stand off was Bruce Laidlaw of Royal High FPs. In his second match he played at centre in a win over Rosario, his fellow centre being another Royal High player, Arthur Orr. The tour was controversial because of the host’s “robust” play while the squad’s visit to Rosario coincided with a local strike which erupted into violence. One evening the Scots defied the local curfew to attend a reception held to the background accompaniment of gunfire and civil unrest. John was brought up in Belford Avenue in Edinburgh, an only son with three sisters Mary, Ann and Janet. His father, also John, was a bank manager who had attended George Heriot’s school as a Foundationer due to his father having been killed in the First World War. Once John himself started attending Heriot’s he felt particular gratitude to the school for giving his father that opportunity. He distinguished himself at sport particularly rugby, playing in the 1st XV and was also a member of the school swimming team as a diver. He swam for the Haymarket scouts of whom he was an enthusiastic member and enjoyed playing tennis at the old Ravelston tennis club. On leaving school he went to Jordanhill PE College whom he represented at rugby in a team featuring future Scotland captain Ian MacLauchlan, later a teaching colleague. A year at Moray House Teaching College followed before his first appointment at Carrickvale School in Edinburgh. By now he had joined Heriot’s FP but was unable to gain a first team place till early 1969. From then on till about the mid ’70’s he was a reasonably regular member of the 1sts after which he dropped down the teams, continuing to play until he was 40. He was also selected to play several times for Edinburgh from the late 1960’s onwards. Contemporaries considered him “an exceptional teammate, gifted with an excellent break and good all round ball skills”. His affable and gentlemanly manner belied a strong competitive streak. His enjoyment of the social aspect of rugby led to meeting his wife Sandra Jardine at a club dance at Goldenacre in 1969. They married in 1971 and went on to enjoy 45 years of close and happy marriage. After Carricknowe he joined Broughton High School before moving to St Thomas’ as head of department. Then in the mid 1970s he was appointed to the same position at the Royal High School. During his time there he was closely involved in all aspects of school sporting life and also assisted with Edinburgh Schools’ rugby. He was a very popular mentor and accomplished coach to many pupils. In about 2000 he left the PE department to take charge of the school’s pupil Support base. He found this role very rewarding, dealing with children excluded from classes and those with difficulties. His patience and warmth of personality were ideally suited to the task. After retirement he and his wife moved to Gullane, East Lothian, in 2005. There John played a lot of golf becoming a member of the local club and lowering his handicap to eight. He and Sandra also played tennis locally and entered into the life of the community. They enjoyed cycling excursions, once going to visit their respective grandfathers’ war graves in Belgium. After the ferry from Rosyth to Zeebrugge they cycled, returning via Calais to Manchester on two wheels. Otherwise John’s main interest was his family of three children and seven grandchildren with whom “he was besotted”. Younger son Callum emigrated to Australia some years ago and John and Sandra went out several times to visit and took the opportunity to explore Down Under. During the last three and a half years of illness he remained utterly positive and upbeat. His family have been overwhelmed by the warm support and kind messages received reflecting the high regard in which he was held. 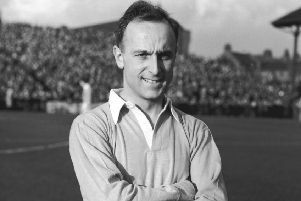 Norrie Macleod,lifelong friend and Heriot’s teammate described him as “everybody’s friend,a very sociable guy who no-one had a bad word about”. Ian Mundie, a friend since Scouts days, added,”John was one of life’s great guys”. He is survived by wife Sandra,sons Simon and Callum,daughter Kirsty and seven grandchildren.